Muppets R Us… – Winning. Words. What do you want from your Muppet movies? Personally, I want Amy Adams, lots of singing and dancing, Kermit the frog being Kermit the frog, and massive budget-blowing explosions. 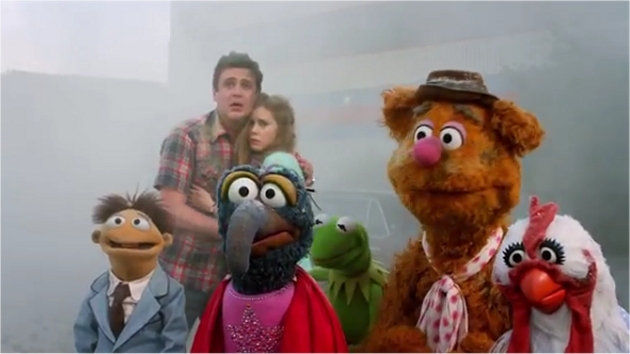 Which – luckily – is exactly what we get in this first teaser trailer for the new Muppets movie. Kudos to the trailer mechanics who came up with the crazy-cool concept behind it. The first 50 seconds set up what looks like a drearily predictable rom-com (dubbed Green With Envy) about Amy Adams’ doomed romance with loveable oaf Jason Segel. Then POW, Kermie and Miss Piggy are listed as co-stars. We all love a little wrong-footing in the name of fun, and this tease pulls it off perfectly.